'Big Sick' Creators Nanjiani And Gordon On Turning Their Courtship Into A Movie In Kumail Nanjiani and Emily Gordon's new rom-com, girl meets boy, girl contracts a mysterious illness and boy's Pakistani parents struggle to accept the relationship. Zoe Kazan stars alongside Kumail Nanjiani in The Big Sick. On the surface, comedian Kumail Nanjiani's new movie, The Big Sick, sounds like a rom-com: He plays a struggling stand-up comedian, also named Kumail, who meets a cute girl, Emily, at one of his shows. Sparks fly and they start dating. But then she finds out he's been keeping her a secret from his Pakistani family; there's a huge fight and they break up. But that's just the beginning. Nanjiani wrote the movie with his wife, Emily Gordon, and they based it on their actual relationship. It's called The Big Sick because Gordon fell ill and needed to be put into a medically induced coma. Gordon says writing about the coma for the movie helped her understand what happened while she was under. "I very much got to dig in and interview my family," she says. "Kumail and I had endless conversations about what that time was actually like and little tiny moments, and a lot of those made it into the movie." The film also explores the tension between Nanjiani and his family over him dating a white woman instead of a Pakistani. Nanjiani says a lot of the script was inspired by his parents — but not everything. In the movie, when Nanjiani's character finally tells his family about his girlfriend and her coma, his mother's reaction is brutal. "You are not my son," she tells him. But in real life, Nanjiani says, "My mom was immediately very concerned for Emily. And then, when Emily came out of the coma and was OK, then my mom was like, 'How could you do this to us?!'" Nanjiani: This scene was written as sort of, you know, me taking my stand and telling them the truth and I sort of tell them everything about all the stuff I disagree with them on. And then the guy who plays my dad in the movie, Anupam Kher, actually says, "The American dream isn't about doing whatever you want to do. You still have to care about your family, you have to care about the people around you. You don't live in a vacuum." So we really, really did a lot of work in making sure there were no bad guys in the movie and that their perspective is just as valid and just as articulated as mine is. 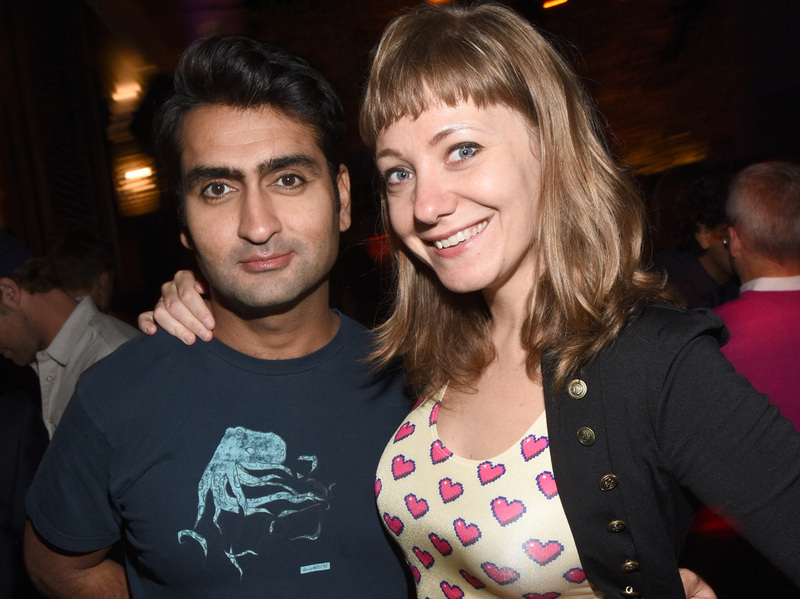 Kumail Nanjiani and Emily Gordon attend a San Diego Comic-Con party in 2015. Nanjiani: When I was sort of telling my parents how I felt about all this stuff, I could feel them being in America and wanting to stay true to their culture, and I would see that brushing up against them wanting to just love me and be my parents. And at some point, they, I think, decided that their love for me was bigger than whatever sense of obligation they felt in this specific respect. Nanjiani: Well, I really thought that I would get disowned by my parents, because that is the narrative that you're sort of raised with. And I was shocked. I didn't give them credit for changing, because they're still changing. You know, when you're a kid you look at them — you're like, "That's those people and they are these people and these are the people they'll always be." But going through this and now they've been in America a little more than a decade, I see them changing as people. I see them becoming different people and I hadn't really considered that. Nanjiani: Where I'm from, we don't have the narrative of children rebelling against their parents. What I realized going through this stuff in real life was, you know, we had that narrative of if you sort of marry outside the culture, we don't talk to you anymore. I have the one uncle and he was like the cautionary tale. You knew about him since you were a kid, you know, he was sort of the absent uncle. With my parents, what helped them, I think, accept it was that they were here. They were in America; they weren't in Pakistan. I think it would have been much harder for them over there. Gordon: I would say, as the white person in that, listen more than you speak. And understand that it's not about you, and just have it be a negotiation, kind of, as things go on. Keep those lines of communication open. Lessons from being a sick person: Appreciate your body, that it's working on a daily basis, because sometimes it stops working and you have to really, really take care of it. Nanjiani: I think, yeah, what Emily said. Understand that there are different ways of doing things and when two representatives from two different cultures come together, it can be beautiful, but it is also quite challenging. Radio producer Anjuli Sastry and digital producer Nicole Cohen contributed to this story.